Al Qaeda No. 2 Warns U.K. Of "Response"
Al Qaeda's No. 2 issued a new audiotape on Tuesday threatening to retaliate against Britain for having honored the novelist Salman Rushdie, a U.S.-based monitoring group said. 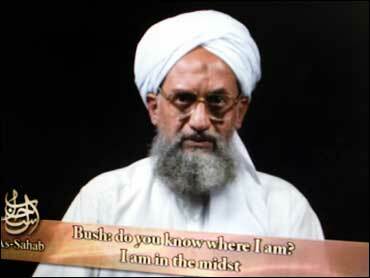 Ayman al-Zawahri's 20 minute speech was entitled "Hateful Britain and its Indian Slaves," CBS News reports. It was produced by as-Sahab, the multimedia wing of al Qaeda, to be distributed to extremist Web sites, said the U.S.-based SITE, which monitors al Qaeda messages. The authenticity of the tape, also reported by Alexandria, Va.-based IntelCenter, could not be independently confirmed. Osama bin Laden's deputy lashed out at Britain for having awarded a knighthood to Rushdie last month, saying it was defying the Islamic world by granting the honor to the author of "The Satanic Verses," deemed an insult to Islam. Al-Zawahri said that a "firm response" is in preparation to retaliate against this offense, CBS News reports. Addressing British Prime Minister Gordon Brown, the al Qaeda deputy chief said Britain's strategy in the Middle East "has brought catastrophes and defeats in Afghanistan and Iraq and even in the center of London," reports CBS News. "If you haven't learned your lesson yet," al-Zawahri continued, "we are ready to repeat it again until we are sure you have fully understood," CBS News reports. A jury that convicted four men of plotting to bomb London's public transport system on July 21, 2005, was dismissed Tuesday after failing to reach a verdict against two other defendants. Judge Adrian Fulford told the jury of nine women and three men on Monday that he would accept 10-2 majority verdicts on Manfo Kwaku Asiedu, 34, and Adel Yahya, 24 (seen at left). He dismissed the jury after less than two hours of deliberations on Tuesday. Authorities believe the failed attacks on three subway trains and a double-decker bus were a deliberate echo of the suicide bombings that killed 52 passengers on the network two weeks earlier. The jury on Monday unanimously found Muktar Said Ibrahim, 29; Yassin Omar, 26; Ramzi Mohammed, 25; and Hussain Osman, 28, guilty of conspiracy to murder. They face sentencing on Wednesday. Fulford gave prosecutors until Wednesday morning to say whether they would seek a retrial of Asiedu and Yahya. A suspect in the failed terror attack on Scotland's busiest airport was unlikely to survive his severe burn injuries, a doctor who treated him said Tuesday. Kafeel Ahmed, 27, is in a Scottish hospital with burns suffered after allegedly crashing a Jeep Cherokee into the Glasgow airport a day after police found two unexploded car bombs in central London. "The prognosis is not good and he is not likely to survive," a member of the medical team that treated him at the Royal Alexandra Hospital near Glasgow said on condition of anonymity because details about patients' condition are not to be made public. "He has third-degree burns over most of his torso and limbs. It is beyond repair and because he has lost so much skin he is now vulnerable to infection and won't be able to fight it." Earlier Tuesday, it emerged that Ahmed had once worked as an aeronautical engineer, as an Australian investigator traveled to India to expand the British terror inquiry. Ahmed worked in Bangalore as an aeronautical engineer for Infotech Enterprises, a large outsourcing firm, from December 2005 to August 2006, said company spokesman K.S. Susindar. Infotech works with some of the biggest companies in aviation, including Boeing and Airbus, among others — possibly giving Ahmed access to sensitive design information from the companies. Susindar declined to comment on whether Ahmed had access to design secrets or what projects he worked on. "He was a sincere employee and from what I can gather he gave no problems whatsoever," said Susindar. The services Infotech offered its clients was not immediately clear, but most of the aviation work outsourced to Indian companies includes software support for cabin lighting, display of information in the cockpit, in-flight entertainment and communication. In some cases, it could involve designing software for flight control systems, navigation and surveillance. Ajay Prasad, India's former civil aviation secretary, doubted Ahmed worked on any sensitive projects. Not much aircraft design work "was outsourced by these companies, so I don't think there is any major (danger)," said Prasad. "Unless one has an idea of what kind of work this company was doing for Boeing or Airbus, it's very difficult to say." Sabeel Ahmed, 26, Kafeel's brother, is being held in Liverpool as a suspect in the terror plot. Sabeel, who worked as a doctor, and Kafeel are among eight people held in the case. A third Indian, Mohammad Haneef, is being held in Australia for questioning.